Professor Sharon Lewin (@sharonlewinPDI) & Professor Robert Grant @GladstoneLabs chaired a plenary with Dr Eric Hunter (pictured left) who spoke about the host and viral factors of HIV-1 transmission, Professor Edward Gane who made a strong case that we will be able to eliminate the silent global Hepatitis C epidemic and explored some of the latest developments in this area, Professor Jeffrey Klausner (@drklausner) who discussed new technologies (such as mobile apps and social media) and innovative methods (e.g. condom delivery service, hairdresser education to promote sexual health) to facilitate HIV prevention, testing and care, and finally Midnight Poonkasetwattana (@apcom) who called for a faster, more immediate, and urgent response from MSM in Asia. The story of Hepatitis C (#HCV) was simultaneously alarming but hopeful. HCV has overtaken Hepatitis B as the leading cause of liver-disease related mortality. An estimated 80 million people worldwide live with HCV (with some 250,000 in Australia). A NYC study showed that 94% of HCV/HIV co-infected people died prematurely (at 54 years old on average). Needle exchange programs are effective way of reducing infections with some 41% of countries having needle exchange programs. In Australia, needle exchange programs have helped reduce new HCV infections by 80%. A cure for HCV is available, but it does not prevent reinfection and targeting risk-behaviour remains a primary prevention strategy. Despite the availability of a cure, however, only 1% of people with HCV worldwide are receiving treatment. Frankly, I was surprised to see so many delegates attending the morning plenary talks. The Joint Conference Dinner at Brisbane City Hall the night before was huge, and I mean huge! 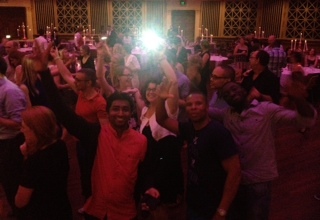 I have never seen a group of academics have so much fun on a dance floor ever before! I have attended conferences on linguistics, psychology, neuroscience, anthropology and ethnomusicology all over the world, but I have never, and I mean never, seen almost every single delegate at the conference dinner get up on the dance floor to move their bodies. Kudos to you AIDS researchers! Kudos to you!!! I think this kind of spirit is demonstrative of a population of researchers who are open-hearted, full of drive, and very community-oriented! Kudos also to The Accidents for being such a fantastic band! Researchers continued to present posters throughout the conference. 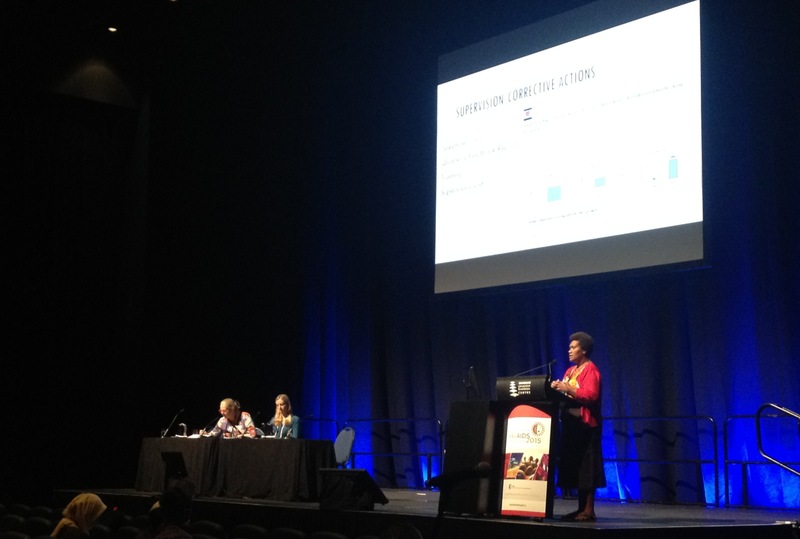 Nancy Aloitch and Gorithie Tai from Papua New Guinea presented their research on HIV. 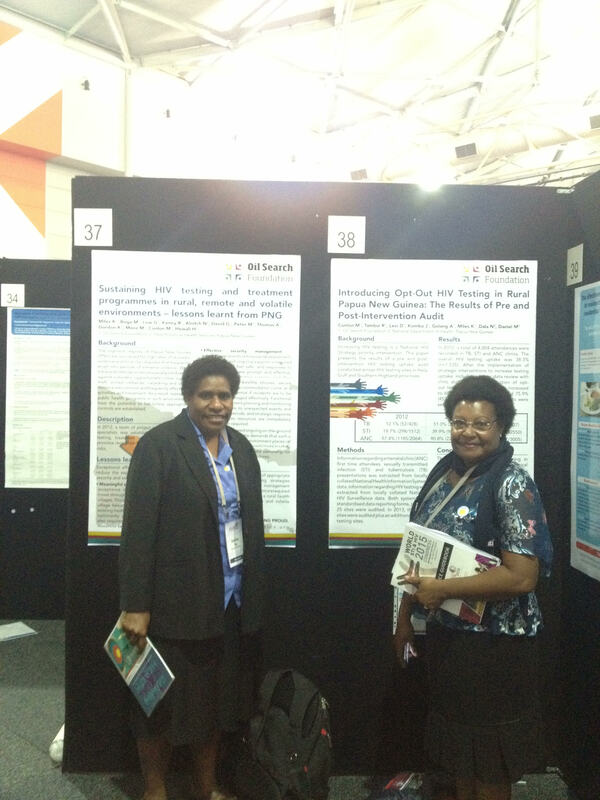 Nancy presented a poster called “SUSTAINING HIV TESTING AND TREATMENT PROGRAMMES IN RURAL, REMOTE AND VOLATILE ENVIRONMENTS – LESSONS LEARNT FROM PAPUA NEW GUINEA“. There is a big call for more anthropologists to work in PNG on infectious diseases such as STI, HIV and TB. The problem is huge and more anthropologists need to come to the table. New initiatives to provide research training and support are an excellent opportunity for capacity building and research development. Abstracts for all the posters are available online. Please also visit summaries of the World STI & HIV Congress Day 1, Day 2, Day 3 and Day 4.